Explanation on Amazon Sales&Deals programs: Amazon Prime, Amazon family, Baby Registry, Subribe&Save, which option is suitable for me? This is not an official page from Amazon, it’s just my own experience on purchasing on Amazon US website. To tell you my story, at the very first time I went to Amazon website, I was stuck at product in detail page. There was no “Add to card” button but a “Subscribe and save” one, however I didn’t want to subscribe at that time because I didn’t know what was that. Otherwise there were a lot of options and I did not know where to go for the next step: Amazon Prime, Amazon family, Baby Registry, Subscribe & Save, etc. What does that mean all those things, which option is suitable for a parent ? Your baby is coming soon ? You’re going to need some items for her/him. Amazon Baby Registry is a program allowing parents to create a needed item list on Amazon website before their baby’s birth. This list can be shared with your family/friends. Special point of this program is people can buy items in your list to celebrate the baby’s arrival. Access to Over 270,000 baby items. B3. To register, what will you have to do ? It’s simple as its name. You just want to do your purchase once. New amazon users will prefer to this option since they don’t know well Amazon programs yet. That’s why I’m writing this article ^^. This programm will be gainful for you if you have regularly need for a same product. 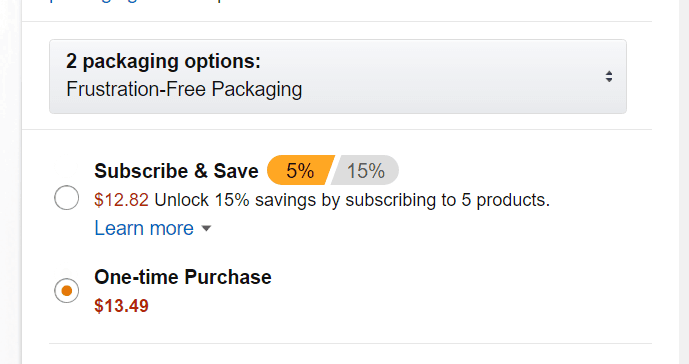 Amazon is proposing deals/sales off for this kind of need with Subscribe & Save program. Meaning for example if you need diapers for your baby or food for your dog, you find out your favorite product on Amazon and would like them to deliver to your door every Saturday morning at 10am, this program is perfectly suitable for you.